I realize this is not the most inspired cookie picture. You are going to have to trust me that while these are not the world's prettiest cookies they are quite tasty and very well loved. I found the recipe here and it made a happy addition to our holiday baking. Not only did it add some color to the plate but it was one of the most commented on cookies. 1. These had a zippy orange flavor and were best loved by people who enjoy tart and/or fruit flavored treats. 2. The original recipe called for a drizzled glaze but given the soft, sticky nature of the cookies and our own misadventures with frosting (hint: follow the directions) we gave up on it. I actually think the additional orange in the frosting would have been too much. These would have been great dipped in or drizzled with dark/semi-sweet chocolate though. 3. 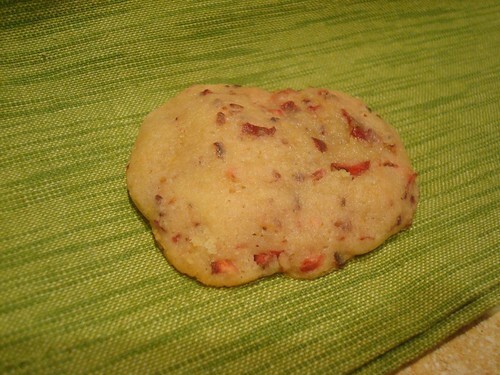 These are not a particularly sturdy cookie, but they package up onto holiday plates just fine.